Barangay Ginebra made sure their losing streak ended at two games. They took down the Columbian Dyip, 97-85 with a balanced scoring effort. 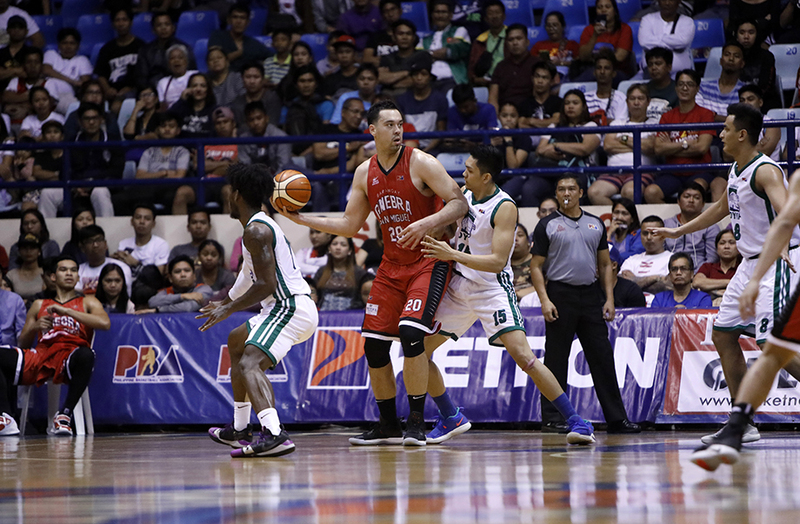 Greg Slaughter led the way for Ginebra with 22 points, 12 rebounds and five assists. The team also got key contributions from Scottie Thompson, who had nine points and 14 rebounds, as well as Joe Devance who chipped in 15 points off the bench. CJ Perez led Columbian with 25 points and seven rebounds. It was a back-and-forth battle in the first quarter with Ginebra gaining the upper hand by only two points after 12 minutes. Ginebra started to pull away from the Dyip in the second quarter. Up by only four points, they went on an 8-0 run built on back-to-back and-one hoops by Art Dela Cruz and Japeth Aguilar. The run was then capped off by a score inside by Slaughter. That blast gave Ginebra a more comfortable 12-point lead. Columbian countered with a run of their own to cut the deficit down to just one. But Kevin Ferrer and Greg Slaughter went on another run. Ferrer scored four straight points to increase the lead up to five. Slaughter scored four straight as well to bring the lead up to nine. Tenorio closed the first half with two free throws to put Ginebra up by 11 once again. It was all Ginebra until the very end. In the third period, Joe Devance and Sol Mercado carried the scoring burden. They were able to push the Ginebra lead up to 17 points with timely hits. The lead stayed at that level, going up as high as 20 points late in the final period after a Ferrer three-pointer. 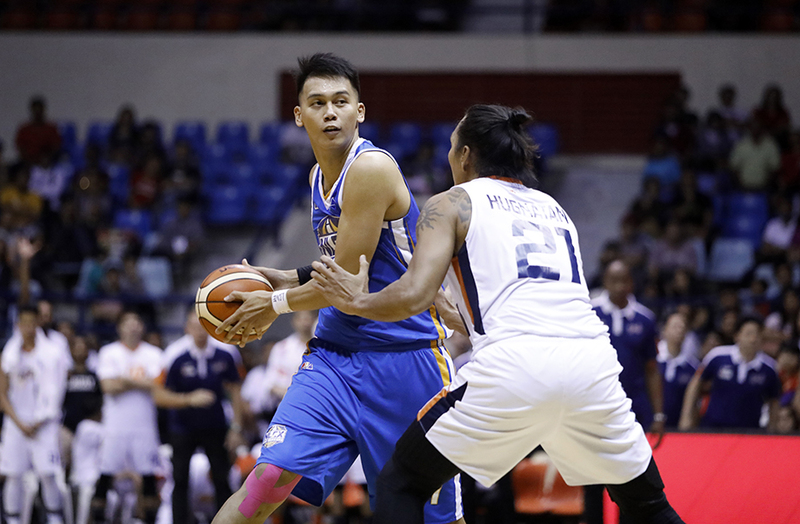 In the first game, the NLEX Road Warriors were able to hold off a final rally by the Meralco Bolts to win, 87-83. The Road Warriors have now won back-to-back games after starting the season with three straight losses. The Meralco Bolts were down by two points with 11 seconds left in the game. They tried to run a play to misdirect the Road Warriors having shooters flash out to open spots. In the confusion, Ranidel De Ocampo flashed to the hoop and Chris Newsome found him with the inbound pass. De Ocampo turned and went up for the shot but the NLEX defense quickly recovered. The ball was slightly tipped from behind by JR Quinahan. De Ocampo still got the shot up, unfortunately for the Bolts, JP Erram erased the shot just as it left De Ocampo’s hands. The Road Warriors secured the ball and Bong Galanza nailed two clutch free throws to seal the win. It was a tight battle between both teams throughout the entire game. Both teams only managed to build a lead a s big as seven points as neither one allowed the other to get the upper hand. Erram continues to shine as the main big man of the Road Warriors. He had 12 points, seven rebounds and five blocks. Quinahan led NLEX with 16 points off the bench. Galanza added 14. For the Bolts, it was the wing duo of Jared Dilliger and Newsome who led the way. Dillinger scored 16 while Newsome had 15.